Alyaf geocomposites being laid at a Riyadh Metro project site. 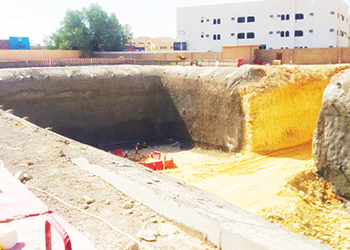 Saudi geosynthetics manufacturer Alyaf Industrial Company has made its mark once again, having started supply of its latest range of geocomposite products for drainage works at the multi-billion-dollar Riyadh Metro project in the kingdom. The company’s geocomposite range, marketed as Alyafgeo composites, has proven to be a game-changer in the Middle Eastern geosynthetics market, claims Al Hasan. The $22.5-billion metro project will feature the construction of six lines across 85 stations connecting government facilities, commercial areas, universities, the financial district, the airport and the Riyadh city centre. Spanning 175 km, the metro network will be built over the course of five years. Alyaf has worked with consultants Ramped and Aecom and contractors BACS (a Bechtel-led consortium) to provide a system for pipeline protection, network liner protection and vertical drainage at the metro project. In line with site-specific considerations of the project, Alyaf recommended using its cuspated Alyafgeo C12 and Alyafgeo S10 geocomposite products for groundwater drainage and its XP geotextile range for pipeline protection. “Alyaf’s drainage systems have been successfully implemented in projects across the Middle East, Asia and Africa. Our vast international experience and references in drainage projects were vital in securing the metro contract,” he points out. He says Alyaf has continually sought to diversify and develop its product portfolio based on the needs of the GCC market. “The Alyafgeo range offers versatile products that can perform multiple functions including drainage, protection, reinforcement and liquid/gas barrier,” he adds. Since 1992, Alyaf has been a market leader, having successfully supplied more than 500 million sq m of geosynthetic products, says Al Hasan. The start of the year saw Alyaf reach two major milestones: the inauguration of its fourth production line in Dammam, Saudi Arabia, for the exclusive manufacture of its geocomposite product range; and receiving the Integrated Management System (IMS) certification – ISO 9001:2008, ISO 14001:2004 and Ohsas 18001:20007 – for its compliance to global standards in quality assurance, environment protection and occupational health and safety. Alyaf supports its loyal customer base with a complete supply package which includes nonwoven geotextiles, Alyafgeogeocomposites, Alfweb cellular confinement systems, Alfgrid geogrids and Alfclay geosynthetic clay liners (GCL) for a wide range of geotechnical applications such as marine construction, road and soil stabilisation, bespoke drainage applications, capillary break layers, salt barriers, roofing systems including specialised garden roof systems, landfills and landscaping. “Over the past two decades, Alyaf has endeavoured to create a culture of continual innovation with an emphasis on value-engineering. Our dedicated team of technical support engineers has been working closely with designers to provide cost-effective solutions for various civil and environmental engineering applications,” says Al Hasan. In the last year, Alyaf has worked on some of the megaprojects in the region such as the New Suez Canal in Egypt, the New Orbital Highway and the Lusail Marina District Project in Qatar and the Aslaa Landfill Cell Five project in Jeddah, Saudi Arabia. The response to the new geocomposite range has been overwhelming, and Alyaf expects greater success in 2015 and beyond, he concludes.